An article in LIveScience reports on results of a study by NASA, using a model they created, that is one of the first that I have seen that attempts to quantify the one of of the results of global warming. 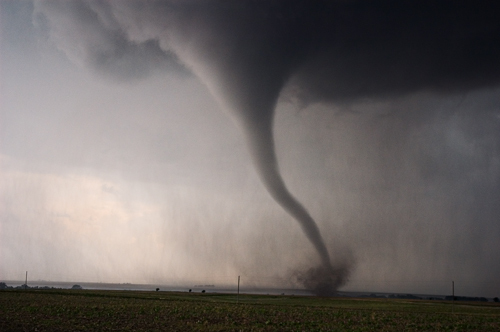 Global warming will make severe thunderstorms and tornadoes a more common feature of U.S. weather, NASA scientists said today (Aug. 30). . . . Researchers ran the model for a future climate scenario where carbon dioxide levels were double their current level and the Earth's surface was 5 degrees Fahrenheit warmer than it is now. The model's projections showed that continents warm more than oceans (a result which is expected because water needs to absorb more heat than land to raise its temperature) and that lightning occurs at a higher altitude where storms are usually more vigorous. These effects would combine to cause more continental storms to be of the strongest kind we see today, though there would be fewer storms overall. These conclusions are particularly bad news for the storm-prone portions of the central and eastern United States, where strong winds are a major source of weather-related casualties. The western United States won't catch a break either—while it is expected to get drier, the storms that do form are likely to have more lightning, which could then trigger more wildfires. Today global warming news is very danger news for earth life. Now this global warming issues takes big picture for this world. Now we are aware about this issue. Climate modelers have taken the place of the shamans of old. Inserting numbers at will, they can create the results they wish. Stories huddled around the fire, creating archetypes, gods, demons and the will to fight the enemy. Maintaining the storytelling nature of humans into the modern age. Excellent. Al Fin, you sound like a bit of shaman yourself. Turning it into a story/legend/myth may be the only way to make people really believe it. Most people's rational minds are not the part in charge. They can't even predict trends 1 or 2 years ahead (see the stupid predictions of NASA for hurricane seasons 2006 & 2007) and they claim to predict what will happen in 50, 100 years, with yet another "new" model ? Aren't we 2 out of 6 so far this season on Category 5 hurricanes in the Atlantic? And didn't we have a record season in the Pacific last year? I agree with Demesure. This "new" forecasting model is a science fair project. They are way out in left field with this. Marc I bet you can predict with rather good accuracy the deaths on the highway for next years labor day. The NASA 2007 predictions for hurricanes are just as easy. The inhabitants of the planet are required to act urgently. Maybe it's not too late. How to plastic bag leads to global warming? isn't it global warming is something about temperature rising?